This article is about the level in the original Donkey Kong arcade game. For the stage in the Super Smash Bros. series based on the level, see 75 m (stage). 75m (or 75 m) is the third stage of the arcade version of Donkey Kong and Donkey Kong for the Game Boy, and the second stage for the Nintendo Entertainment System version. This level features elevators, with Springs bouncing from beyond Donkey Kong's position. Mario starts at the bottom left of the stage. After climbing ladders on the left, he takes the elevators downwards to the center platforms while avoiding the Fire. This is the only level without a hammer which means he is defenseless. After crossing the second gap of elevators, he has to climb upwards to reach Pauline. As soon as he arrives on the top platform, Donkey Kong will grab Pauline and they will proceed to 100m. 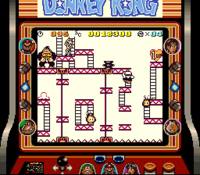 In the Game Boy version of this level, Donkey Kong throws the springs, and a 1 UP Heart and Pauline's hat are present. Several platforms are also missing in the Game Boy version to accommodate for the smaller screen. Bag: On the right side of the screen. Mario needs to climb a ladder and avoid a Fire to get the Bag. Hat: On the bottom of the girder with two ladders and a Fire. Parasol: On the third girder above where he starts. Mario needs to climb two ladders up to the girder. Note: The Bag and Parasol are absent in this level in the Game Boy version, which only features the Hat found in the same location as the Parasol in the arcade version. In Super Smash Bros. Brawl, Super Smash Bros. for Wii U and Super Smash Bros. Ultimate, 75m appears as a stage. Though there are some minor differences, the stage is very similar to the NES version of the level.